In a recent post, I reviewed the evidence on equity valuations and concluded that, according to the most credible metrics, US equities are close to the richest valuations on record. But it is not only equities that are expensive. Government bonds are expensive. Corporate bonds are expensive, especially high yield or junk bonds. Real estate is expensive. In short, most asset classes are expensive. This means that, while one cannot confidently forecast short-term asset class returns, one can be fairly confident that long-term returns on these asset classes will be quite low relative to recent history. This note discusses the two main reasons why markets are so richly priced. It examines the role of central bank policies and corporate management behavior in bidding up asset prices. When central bank policies and/or corporate behavior change, asset prices will likely move, either gradually or suddenly, toward fair value. The period of transition will be a nervous one for investors. Central banks have played a central role in enriching asset prices since the Great Financial Crisis (GFC). As the GFC unfolded, major central banks cut their policy rates to close to zero and, because they felt that this did not provide sufficient stimulus, resorted to various forms of quantitative easing (QE). QE involves the large-scale purchase of government bonds or private assets such as mortgage-backed securities. 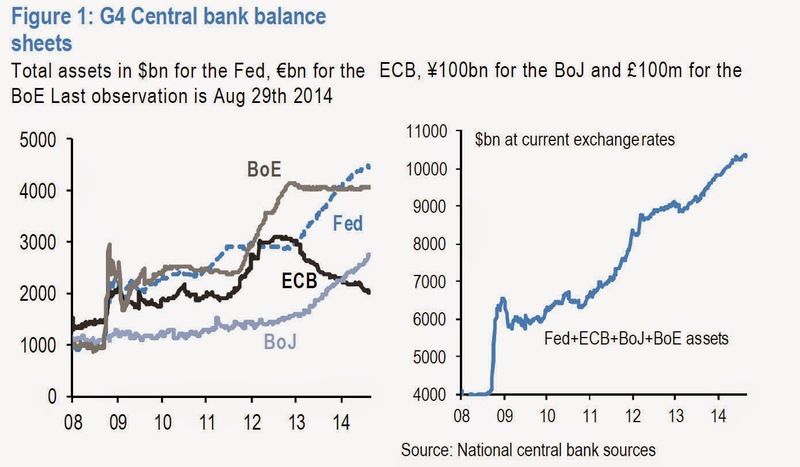 As central banks engage in such purchases, the size of their balance sheets expands. The charts below, from a recent report by Nikolaos Panigirtzoglou of JPMorgan, show the growth in the size of the balance sheets of the US Fed, Bank of England (BoE), European Central Bank (ECB) and Bank of Japan (BoJ) in the left hand chart and the combined expansion in US$ of the four central bank balance sheets on the right. The result has been that the total balance sheet of the four big central banks expanded from $US 4 trillion in 2008 to almost $US 11 trillion by the end of August, 2014. By cutting their policy rates to close to zero and providing forward guidance that policy rates would stay exceptionally low for an extended period of time, the central banks have encouraged investors reduce their holdings of cash and to take more risk. Investors have responded by bidding up prices of equities, commodities, government bonds, corporate bonds, real estate and infrastructure assets. By undertaking QE, central banks have provided the liquidity to support investor's risk-taking. The result is that many equity markets are richly-valued, while government bond yields have fallen back toward post-GFC lows more than five years into the tepid global recovery. Corporate and emerging market bond yield spreads over US Treasuries are near their pre-GFC lows. Real estate prices in many countries are at record highs. As Panigirtzoglou argues, "Asset yields are mean reverting over long periods of time and thus historically low levels of yields in bonds equities and real estate are unlikely to be sustained forever." The second, but much less discussed source of overvaluation of asset prices is corporate behavior, specifically what is known as the “bonus culture”. Andrew Smithers has developed the most insightful analysis of this change in corporate behavior brought about by changes in the way that management is compensated. As Smithers explains in his new book, The Road to Recovery, the shift in executive compensation systems over the past two decades to rely heavily on bonuses combined with changes in corporate accounting rules have increased both management’s incentive and ability to overstate corporate profits. This means that profits are regularly overstated in good times and then understated through write-offs during bad times. As bonuses usually depend on changes in profits, companies’ managements will usually be able to benefit from both over- and understated profits. When profits are overstated, they will rise more than they otherwise would have done and bonuses will rise with them. When profits are understated in one year but not the next, the rise in profits will also be exaggerated, together with the associated bonuses. Managements therefore want profits to be volatile. As management gets what management wants and what management wants has been greatly eased by marked to market accounting, the result has been the growth of periodic write-offs. Assets are therefore periodically written up or written down. The associated write-offs are either an admission that profits have been overstated in the past or a promise that management will try to overstate them in the future. Smithers also explains how the bonus culture leads corporate management to favor buying back corporate equity over investing in new capital equipment and software. Equity buy-backs increase earnings per share in the short term, while investment in capital equipment reduces earnings per share over the same period. Increasing earnings per share increases management bonuses and so is the more attractive choice. Stock buybacks are a major cause of equity overvaluation. The chart below, from a recent article by Henry Blodgett posted on Business Insider, shows that in Q1 of this year “equity buybacks hit almost the highest level in history -- exceeded only by a couple of quarters in 2007, just before the market tanked”. By Blodgett’s calculation, stock buybacks, which reached US$159 billion in 1Q14, have outstripped new share issuance for several years and, as a consequence, the total number of shares outstanding for S&P500 companies is now lower than it was in 2005. 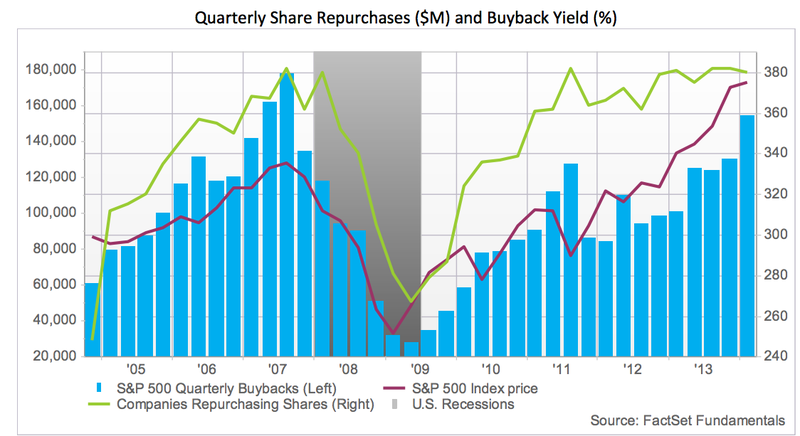 Share buybacks have been financed by corporate cash flows, which have been waning recently, and by issuance of debt which has levered up corporate America. What will end the Overvaluation? The two main drivers of asset overvaluation are central bank policies, (specifically near-zero policy rates and large-scale QE) and corporate behavior (specifically overstatement of profits and equity buy-backs). Overvaluation will likely diminish, perhaps rapidly, when these policies and behavior change. Quantitative easing by the Fed is set to end in October and the policy rate is expected to begin to rise some time in the first half of 2015. On previous occasions when the Fed has attempted to end QE, equities have weakened and bond yields have fallen as investors feared that the economy would slump as monetary stimulus was reduced. However, in this instance, US growth appears to be accelerating, the economy is operating closer to full capacity, and the Fed is expected to follow up termination of QE with an increase in the policy rate. If the growth acceleration continues and inflation remains stable, the US Treasury bond market is likely to sell off. If the growth acceleration continues and inflation moves above target, all asset markets are likely to weaken. A potential mitigating factor is that the ECB may be preparing a new round of large scale QE, but this might just add to volatility in foreign exchange and other markets. Stock buy-backs are likely to continue as long as corporate cash flows remain solid and bond investors remain willing to buy corporate debt at relatively narrow spreads over government bonds. 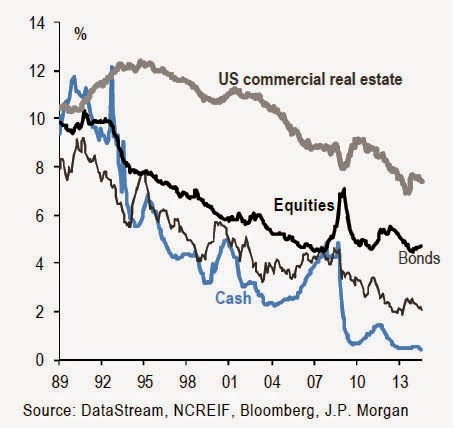 However, there are signs that cash flow growth has peaked and that investors are becoming wary of corporate credit. Should corporate profits and cash flows be squeezed by the faster wage growth that Fed Chair Janet Yellen wants to see, the massive flows into high yield and investment grade corporate debt driven by investors search for yield could reverse. Strategists have pointed out recently that regulation has reduced the willingness and ability of bank-owned dealers to make liquid markets in corporate debt. Should investors decide to significantly reduce their corporate debt holdings, not only would credit markets suffer potentially serious losses, but a major source of funding for equity buy-backs could dry up. It is, therefore, for good reason that the Fed and the Bank of England are likely to move toward tightening policy with great caution. Beginning the process of reversing years of extreme monetary ease could prove quite unsettling to richly-valued financial markets.